The 53rd animated film in the Walt Disney canon is a musical adventure celebrating the bond of sisterhood. The idyllic childhood of two princesses is disrupted when one little girl accidentally freezes her younger sister with her powers. Anna is cured, but Elsa subsequently isolates herself so as not to endanger her sibling again. After their parents are tragically killed at sea the elder Elsa becomes queen. On her coronation day, a disagreement between her sister causes Elsa to inadvertedly trap the kingdom of Arendelle in eternal winter. She flees amidst accusations of sorcery. Anna sets out to find her sister the Snow Queen and seal the rift between them. Frozen has been molded very much in the same girl power attitude that has been a characteristic of every Disney princess since Beauty and the Beast in 1991. Both are feisty independent women that don’t need to rely on a man, thank you very much. This time the final resolution manages to tweak the formula in a way that gently affirms the importance of family. Frozen has been promoted as based on Hans Christian Andersen’s fairy tale The Snow Queen. They both share a snowbound location and have a queen, but the plot has a lot more in common with the storyline of the smash musical Wicked. The tale of two sisters, one incorrectly labeled as a monster when she’s simply just misunderstood, parallel each other. The voice cast even features the star of that production, Idina Menzel. That’s appropriate since Frozen has been fashioned as an old school musical. Menzel is Elsa, former princess now Snow Queen. Anna, the younger sister and also a princess is portrayed by another theater alum Kristen Bell (The Adventures of Tom Sawyer). Rounding out the primary cast are Jonathan Groff, Santino Fontana, and Josh Gad. Broadway stars all. Frozen’s transition from animated movie to the inevitable stage should be a smooth one. Frozen is an enjoyable production. The picture favorably compares to recent hits like Tangled. The musical is highlighted by a few really good songs. “Let It Go” in particular is a first rate ditty that I was still singing as I left the theater. The anthem about looking forward to the future, is one of their best songs in years. The music is composed by the husband-and-wife songwriting team of Kristen Anderson-Lopez and Robert Lopez. The latter of whom collaborated on the music & lyrics for Avenue Q and The Book of Mormon. And while the complete score doesn’t approach the apex of composer Alan Menken in his prime, there are some standout tunes: “For the First Time in Forever”, “Do You Want to Build a Snowman?” and “Love is an Open Door” are among them. As usual an anachronistic mentality plagues a Disney movie. It’s never clear why a tale set in 1845 in a Nordic setting, is beset with teen protagonists that talk like they’re from the San Fernando Valley. The pair of women parrot vocal inflections like they just stepped out of a rom com. In contrast, side characters like The Duke of Weselton and Wandering Oaken, the owner of a Trading Post (and Sauna), speak with accents germane to their respective origin. The physical details of the princesses is a bit of a snooze. Pretty, tall and slender with huge doe eyes, they sport virtually identical facial features down to their freckles. The main difference? Anna has red hair and Elsa has white hair. Once again, a supporting sidekick is the most memorable personality. Olaf the Snowman steals the show. His buck toothed expressions are amusing and provide the laughs, although his goofy shtick feels like it belongs in a completely different story. There are a group of Trolls that are entertaining as well. Frozen is a visually spectacular tribute to sisterhood for the entire family. It’s a solid addition to their recent cannon. Granted Disney’s tendency to favor a modern sensibility pales to depicting the actual time period. The studio’s quest to subvert the traditional princess has been their ongoing mission for the last 20+ years so the way they tweak “formula” is nothing new. Its contemporary take on princesses is very much a product of our times. Idiomatic twenty-first century argot taints the proceedings. There are genuine moments of inspiration, however. One has Elsa, the Snow Queen building her snow castle using her own supernatural abilities. The sequence highlights the movie’s signature song “Let It Go” a soaring declaration that says goodbye to the past, rejoicing that she no longer has to hide her gift. With arms outstretched, Elsa builds an ice staircase as she simultaneously ascends up to the sky, Snow flurries abound. She stomps the ground and a fractal image of a snowflake grows from under the foot. Then she raises her hands and a glittering shiny ice castle of frozen spires appears from all around her. It’s a positively gorgeous spectacle, among the best of the year, and a joyous reminder of the heights to which music and images can combine in a Disney film. Not since Superman & his Fortress of Solitude has a home been made so beautifully in ice. This entry was posted on November 28, 2013 at 8:00 pm and is filed under Adventure, Animation, Comedy, Family with tags 2013. You can follow any responses to this entry through the RSS 2.0 feed. You can leave a response, or trackback from your own site. Did you like Tangled? (I did) It’s in the same class. Actually I have not seen that one either. haha. Good review Mark. This one really caught me off-guard. Not because it was actually good, but because it appealed to both sides of the demographic, without making too many jokes that were “too mature” and would deliberately go over the kid’s heads. Yeah Disney always caters to kids and their parents pretty well. Last year’s Wreck-It Ralph was a perfect example of that. Perfect example. Although I felt like it’s catering was a bit more obvious that time around. With Frozen, it didn’t necessarily go for just boys, girls, or even parents. It was all-over-the-place, but it wasn’t messy in the slightest bit. Wreck-it-Ralph I cannot believe I have not gotten to yet. That was the closest I was tempted into seeing an animated flick last year. You didn’t see Brave? Not that it was great, but I’ve noticed you avoid some pretty major films. I still can’t believe you’ve missed the entire Harry Potter series. Change your mind? I’m confused. I’m recommending the film. Sorry. Blame my awkward syntax. I’ll try to express the thought a different way: I was looking forward to the film prior to reading your review. After reading it, I’m still looking forward to it. I think this one looks really good, and you have reinforced that expectation. I’m not really sure about this one Mark. I feel like I should evaluate Tangled, just to see how I like it, and then see Frozen. They look similar. I’ve heard a lot of comparisons to Disney’s older works though so it’ll probably be good as you seem to say. Tangled is good too. I think Frozen is going to be an even bigger hit. Huge business this weekend. Fantastic review, Mark. 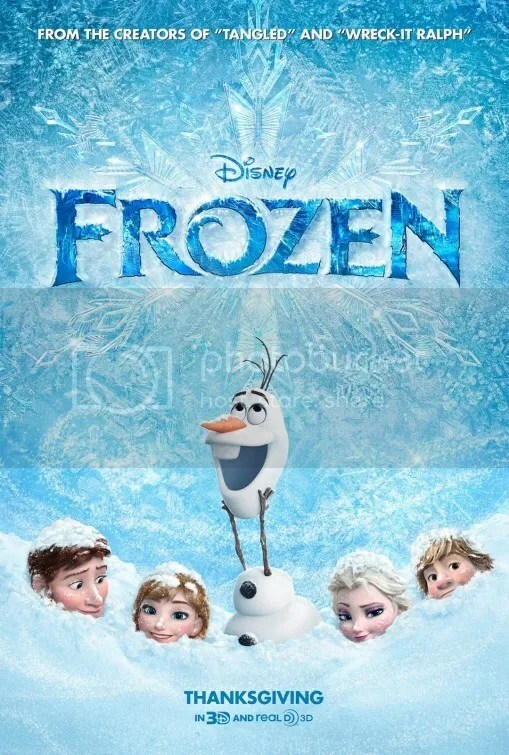 Really want to see Frozen after seeing many reviews that praise it. Listen to the soundtrack first. It’s so good. First off, I love that you called one song a “first rate ditty.” How delightfully old-fashioned of you haha. I wasn’t aware of the parallels between this and Wicked. I’m happy to read that this film balances family with strong female characters a bit better than some of its peers. Your criticism of anachronism given their silly choice to set this in the past, along with your comment about the delightful, yet out of place sidekick are pretty much what I expected to be this movie’s major faults. Sounds like there are some entertaining songs and that overall it’s a good time however. I’m sure I’ll catch Frozen in the next couple of months. A lot of people don’t find characters with a modern sensibility to be a fault. However I look at classic Disney like Snow White, Pinnochio and even The Little Mermaid and I find those characters have a magic to them that transcends time. I really enjoyed this a lot. I found myself singing the songs days after I saw it. Such a fun animated story. Disney did good with this one. Agreed. The music was great. I really enjoyed this film. The plot is alittle on the slight side, but the music really made it excel. The film has seversl visually spectacular scenes. The building of Elsa’s snow castle was perhaps the greatest. I was disappointed that Prince Hans was much too abruptly turned into a complete villan, When he was left in charge of the castle and helped distribute aid to the abandoned citizens made him a possible mate for Elsa. Before the refusal to kiss Anna ,I had no clue to his villanhood. The transformation happened too fast. I got the feeling he was always evil, but was hiding it to get into Princess Anna’s good graces.